Many state and the vast majority of local education agency websites do not disclose the presence and nature of this ad tracking and user surveillance, or the mechanisms for how users can opt out of these data collections. Those few that do make such disclosures often do so in misleading ways, including by making demonstrably false statements about their privacy practices. The use of third-party ad tracking and online surveillance technology was found to be nearly universal on both state and local education agency websites. While the use of Google user tracking technology, including but not limited to the use of Google Analytics services, was found to be deployed on 9 of 10 state and local education agency websites, well over 40 unique tracking services were identified in the limited scans conducted by this study. Also commonly found on state and local education agency websites were ad trackers provided by Twitter and Facebook. 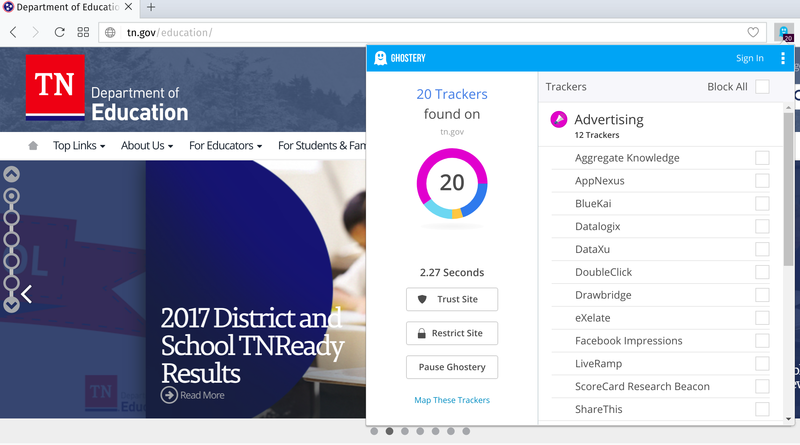 The Tennessee Department of Education website deploys a large number of ad trackers. Retrieved October 25, 2017. Report of Firefox’s Lightbeam extension after a brief visit to a school district website (recorded on October 26, 2017). Triangles represents tracking of this visit by third-parties, including online advertising companies. State department of education websites, like those offered by Maine and Utah, demonstrate that state and local education agency websites can offer meaningful, privacy-respecting experiences to parents, educators, and other stakeholders without resorting to invasive and undisclosed ad tracking. School districts included in the study were drawn from the membership of the Council of Great City Schools; the League of Innovative Schools, a program of Digital Promise; and, members of the first cohort of the Consortium for School Networking‘s Trusted Learning Environment Seal initiative. Membership in these groups was not found to be consistently associated with better website security or privacy practices. EdTech Strategies, LLC, is a boutique consultancy focused on providing strategic research and counsel on issues at the intersection of education, public policy, technology, and innovation. Douglas Levin is founder and president. A trusted adviser to federal and state policymakers and education leaders, Mr. Levin has conducted high-profile empirical research that has informed and shaped the field, helped build unique online tools for educators and school leaders, and written and spoken widely about the trends shaping the future of education. He developed and maintains The K-12 Cyber Incident Map, a unique resource that sheds light on emerging school cybersecurity issues and practices. For more information, please visit: https://www.edtechstrategies.com.